Keep up with South Of The Border news, events & happenings in the community. South of the Border Tourist Attraction has joined Youtube with our very own channel. That’s right, you can now catch Pedro on Youtube, and share your videos with him. We have uploaded our very first video, which is a High Definition Virtual Walk-Thru. Our video takes you around the grounds to see some of our attractions like the Reptile Lagoon, and into our shops to see some of our kitschy souvenirs.It showcases all the newly renovated and repainted areas that we’ve been working very hard on for the last year. You will find new coats of paint on all our buildings and statues, along with new neon and LED signs. Our hotel rooms have also been updated as well, and Camp Pedro is looking fresh too. If you haven’t stopped by to see Pedro lately, we think you will be very pleased with our shiny new looks. Give Pedro a ‘thumbs up’ on the video and don’t forget to subscribe to be notified when we have a new videos on our South of the Border Youtube Channel. The new SOB Youtube channel has more than just our feature video. We have created Playlists for our sister companies as well. You can see videos reviewing our Good Ole’Blenheim Spicy Ginger Ale, a South Carolina soft drink that’s been around for more than 100 years. There is some awesome classic 70’s footage of the old bottling plant from the Charles Kuralt show. We also have videos of all the action from our newest attraction, South of the Border Motocross Training Facility. 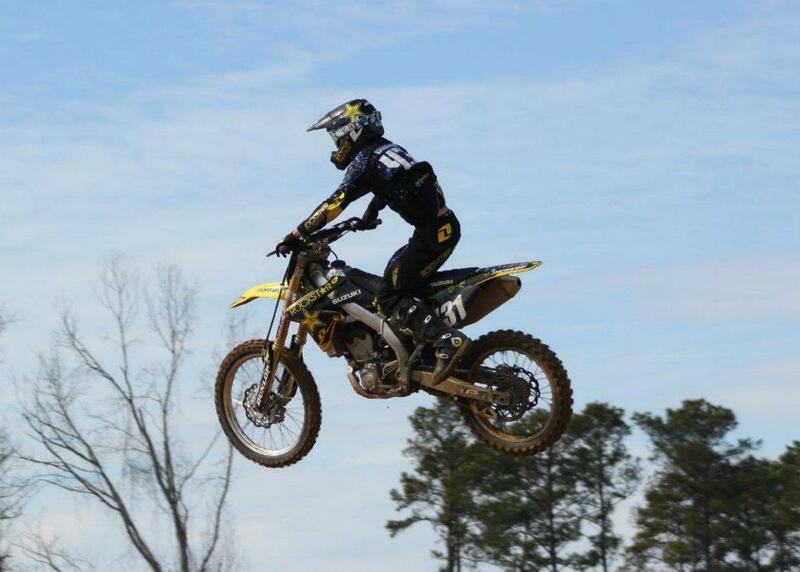 Our track hosts several motocross events each year and trains some of the finest young riders on the East Coast. Pedro has also searched through all the great videos on Youtube to find ones filmed at South of the Border by our fans. If your family has some video from your trip to visit us, let us know so Pedro can add it to our Fan Playlist. You can also tag us on Instagram @SOBPedro to see your pictures and video come up on our website sidebar. 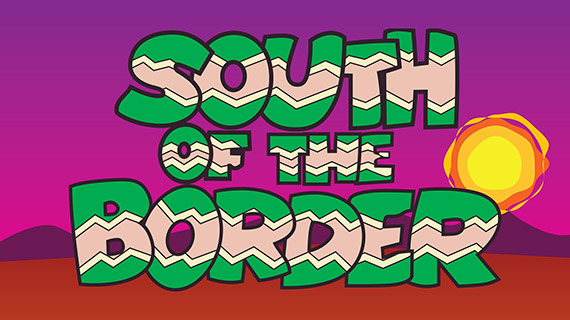 Help us make our new South of the Border Youtube Channel as much fun to visit as Pedroland! 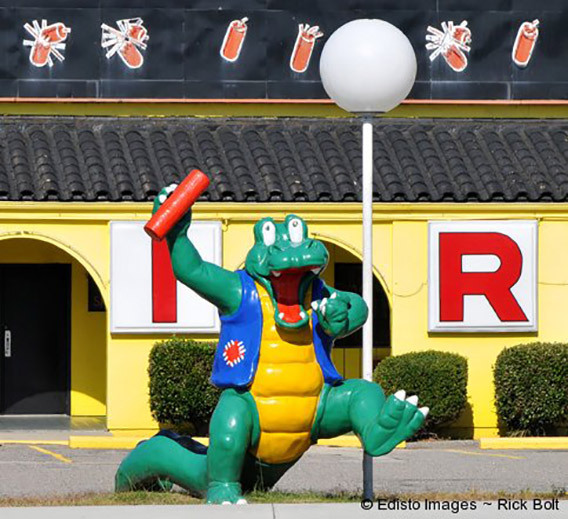 South of the Border Tourist Attraction in Hamer, SC is one of America’s favorite roadside attractions. For 60 years our Mexican themed attractions have tempted travelers along Interstate 95 to stop in for a visit. Our 100 foot tall statue of our mascot Pedro sports a huge sombrero, and you can find your own sombrero in one of many South of the Border gift shops. 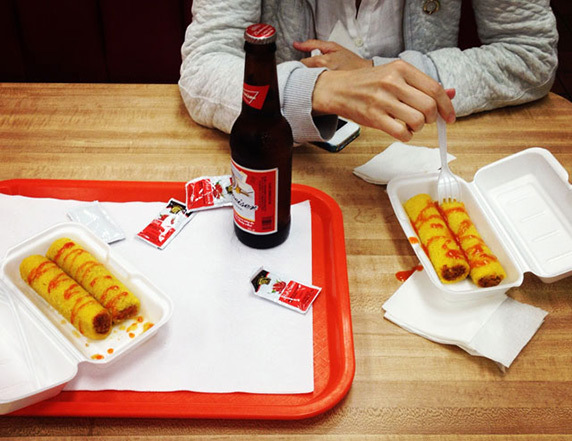 You can grab some quick Tex-Mex food like tamales and nachos at our 24-hour Hot Tamale Diner. You can also get a cold beer and some spicy Mexican favorites like burritos with re-fried beans and rice at The Sombrero Restaurant. 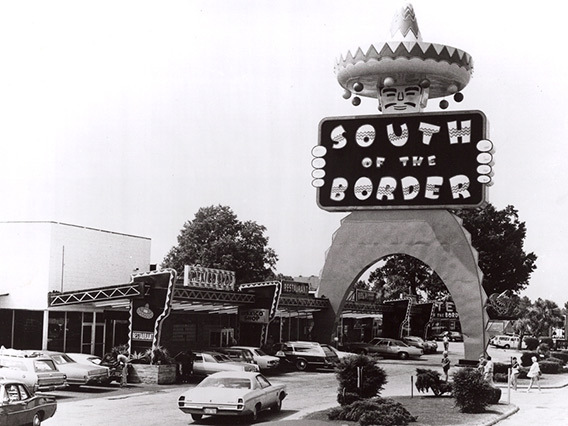 The South of the Border theme came about when the founder Alan Shafer took a trip to Mexico to buy trinkets for the gift shop. He helped two young Mexican men immigrate to the U.S. and gave them jobs. One of them was nicknamed Pedro, and pretty soon everyone just started calling each other Pedro and a tradition was born. It didn’t matter what race or nationality anyone was, they all called each other this nickname. 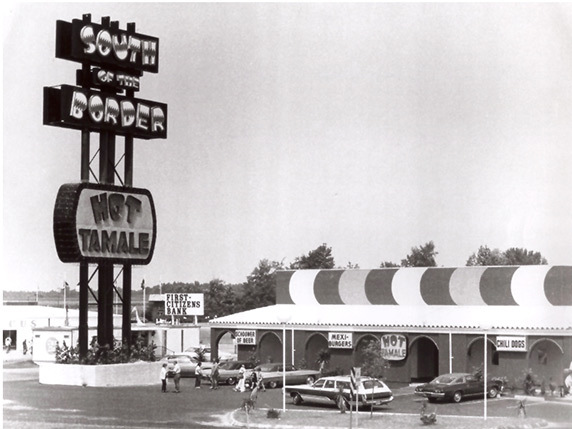 The South of the Border theme evolved from this inside joke among employees, and Mr. Shafer’s desire to help two young men come to America for a better life. One of the most popular holidays of the year is Cinco de Mayo. Many people are under the impression that’s it’s a day to celebrate Mexican Independence. However, Mexican Independence day is actually September 16th. That’s when Roman Catholic priest Miguel Hildago encouraged his congregation to revolt against Spanish rule. Cinco de Mayo began in Mexican-American towns in California and the Southwest United States, and in the Mexican state of Puebla where it’s known as El Día de la Batalla de Puebla, or The Day of the Battle of Puebla. Cinco de Mayo is a celebration that grew out of the American’s appreciation of the Mexican’s help in turning back the French Army from helping Confederate soldiers in the American Civil War. On May 5th, 1862 the Mexican Army had a surprising victory over the French forces in Puebla. Over the years it has turned into a celebration of Mexican culture and heritage. In 2005, Congress passed a resolution to have the President declare Cinco de Mayo a day of appreciation with ceremonies and activities about the Mexican and Latino culture. 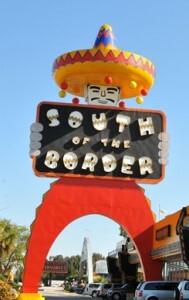 Everyone at South of the Border shares the respect of the Mexican culture, while also having a bit of fun with theme. Our founders, workers, fans and hopefully all our visitors understand the wonderful and incredible contributions our neighbors to the south have given the world. So everyday at South of the Border is like Cinco de Mayo for us. Join the South of the Border Facebook Group and follow Pedro on Twitter. Our new South of the Border Instagram feed is great way to see our pictures. And don’t forget to tag Pedro in your photos with #sobpedro. 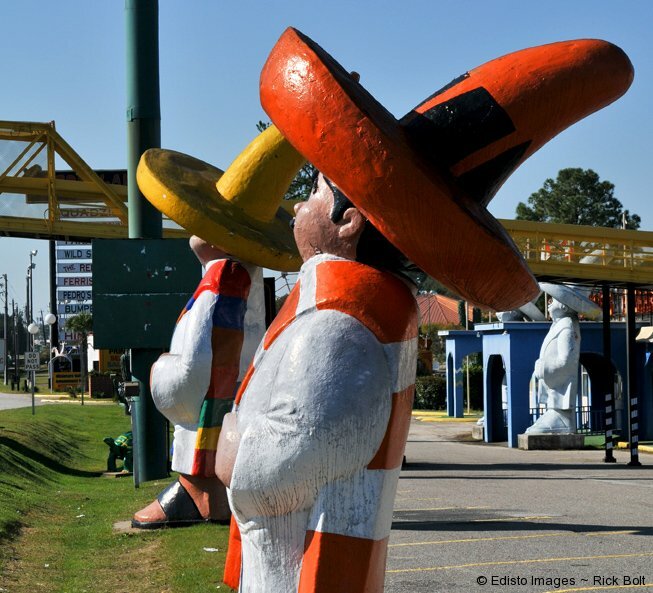 South of the Border Tourist Attraction in Hamer, SC has been called one of America’s Kitschiest Attractions. Our shops are filled with some of the most wild and silly items you can find anyplace in America. So bring your sense of humor along with your wallet. We are well known for our humorous billboards that stretch for hundreds of miles along Interstate 95, leading you to our complex’s location at the North and South Carolina state line. The South of the Border grounds are home to a flock of whimsical animal statues. These whacky and wonderful animals are spread throughout the complex, so plan to spend plenty of time when you visit so that you and the kids can find all of them. 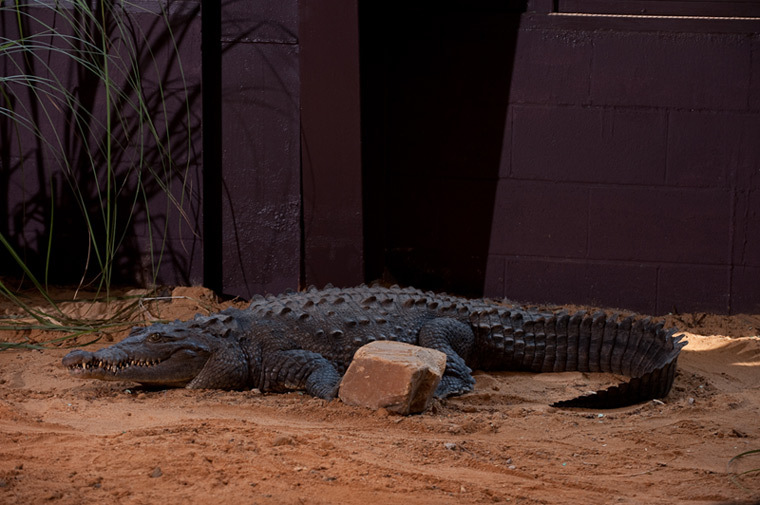 Unlike the scary creatures that you can find in our Reptile Lagoon like crocodiles and alligators, our animal statues are lighthearted, colorful takes on animals you might find in a zoo. They have all been restored, repaired and repainted as part of our multimillion dollar renovation project. 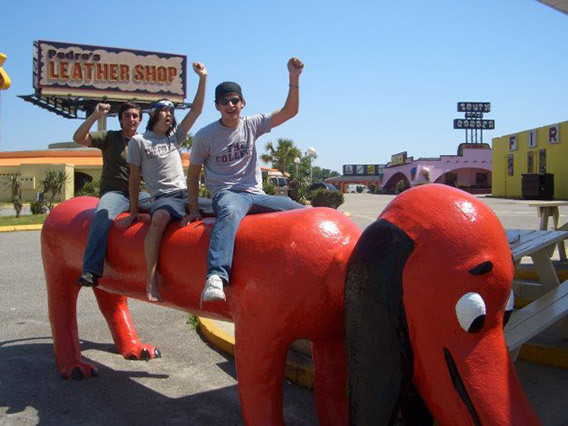 We have pictures of the South of the Border animal statues from our archives and from combing the internet to find photos of visitors posing with our crazy creatures. If you have photos of the time your family spent with us, make sure to them tag them with the South of the Border Instagram hash-tag #sobpedro. Then look for your photos on our Instagram page. Our goofy green gator guards the Fireworks store. 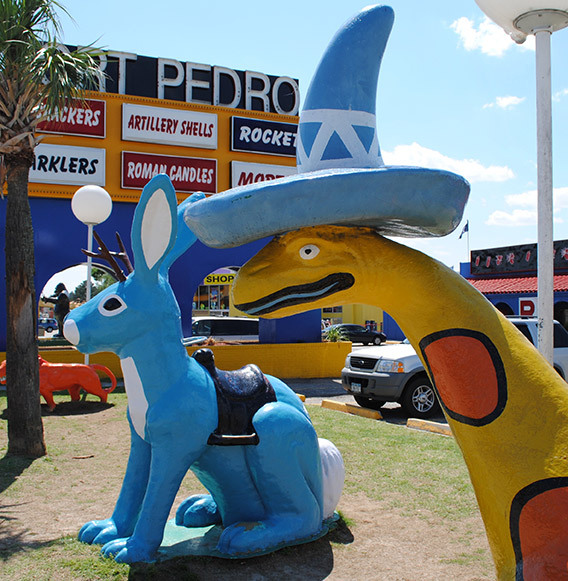 Our big blue Jackelope and a dinosaur with a sombrero. Doesn’t get much more whimsical than that. 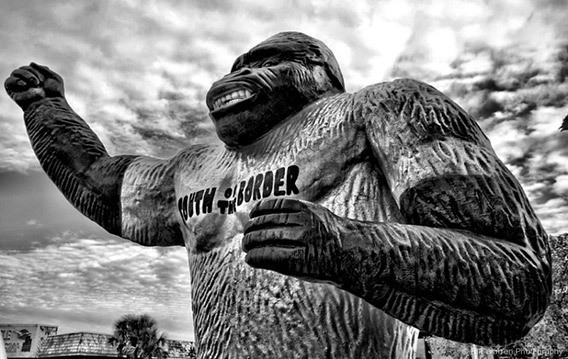 A very artsy picture of our giant gorilla statue from the talented Rick Warren. 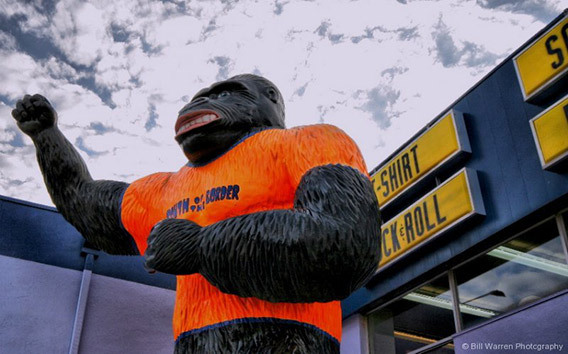 A full color picture of the South of the Border giant gorilla statue by Rick Warren. Ever seen a 10 foot long wiener dog? You can find it outside Pedro’s Hot Tamale Diner. 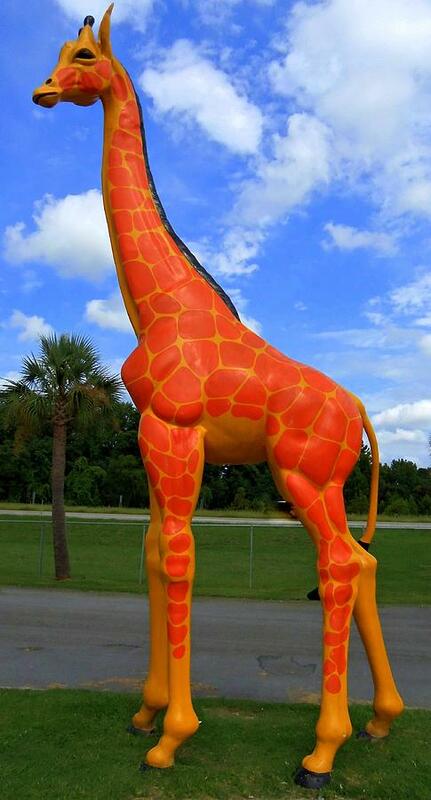 Our big orange giraffe is almost life size. Many of our visitors have a great time taking photos with our eccentric collection of animal statues. We found a great collection of pictures of them on the Will Work for Travel blog. The photo of the girl in front of our gorilla above comes from here, and they have quite a few more hilarious poses with our kooky creatures. 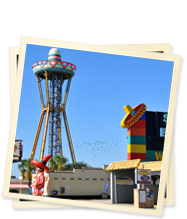 If you have any photos or stories about your adventures at the South of the Border Tourist Attraction, leave us a comment below. And don’t forget to tag your Instagram photos with #sobpedro to get them added to our picture feed. 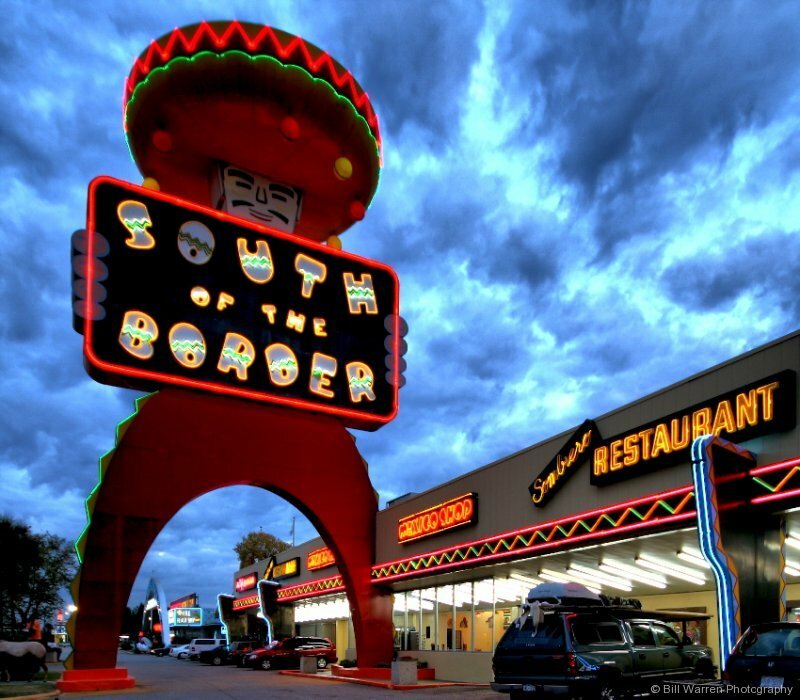 South of the Border Tourist Attraction sits at the North Carolina and South Carolina state line along Interstate 95. For more than 60 years travelers and locals have stopped here for our crazy collection of things you never knew you needed. You can get a souvenir t-shirt starring Pedro, a scare in our Reptile Lagoon, fuel for your car and fuel for your tummy at one of our six places to eat. And don’t forget some Good Ole Blenheim Spicy Ginger Ale to wash it all down. 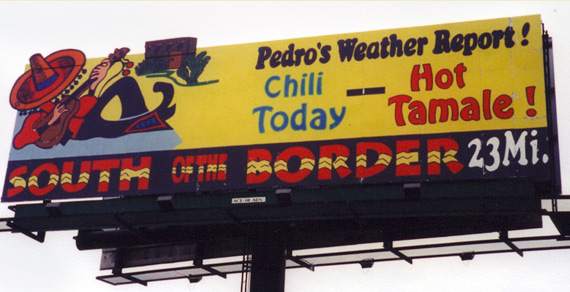 One of the most famous South of the Border signs is the one with Pedro’s Weather Report “Chili Today-Hot Tamale”. The polar vortex has Pedro predicting “Chilly Today-Hot Tamale” for this winter season. A great way to knock the cold out of your bones is lunch at our Hot Tamale diner, but it’s open 24 hours a day so you can drop in anytime. We serve great Tex-Mex food like tacos, nachos and tamales. Our special this winter is the BRRRRRR-ITO. Ok, we’re just kidding but it has been really, really cold. We are known for our tasty namesake the hot tamale. You can even grab a cold beer to go with your hot tamale too, just make sure someone else takes the wheel when get back on the road. The Hot Tamale also has American favorites like burgers, fries and hotdogs. Our Gigantic Big Dog topped with chili, mustard and onions is a favorite with many guests. Some places might have a foot-long hot dog, but how many have a ten foot long dog like Pedro? Probably not too many. 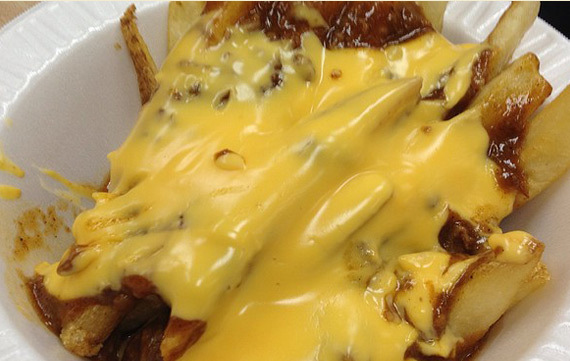 And our fries topped with chili and cheese goes great with anything. 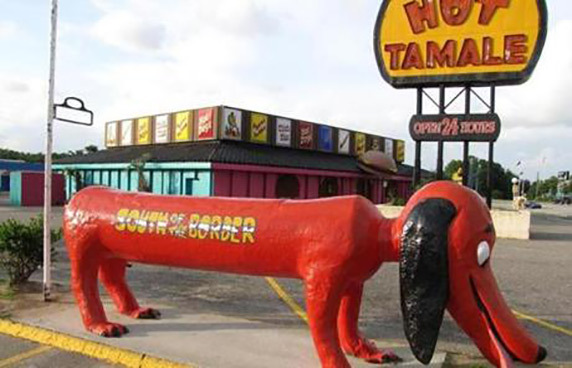 The Hot Tamale diner at South of the Border is the perfect place to stop off for a quick bite on your trip through the Carolina’s on Interstate 95. Join us the next time you come through. Join the South of the Border Facebook Group and follow Pedro on Twitter. Our new South of the Border Instagram feed is great way to see our pictures. And don’t forget to tag Pedro in your photos. South of the Border Tourist Attraction in Hamer, SC is now on Instagram. Instagram is the world’s top mobile photo-sharing app. Thousands of pictures are uploaded every day with Instagram to sites like Facebook, Twitter and Tumblr. We have added some fantastic new photos to our website. Check out all the new pictures and leave us a comment about which one is your favorite. Then check out all the new updates to our website and let us know what you think. 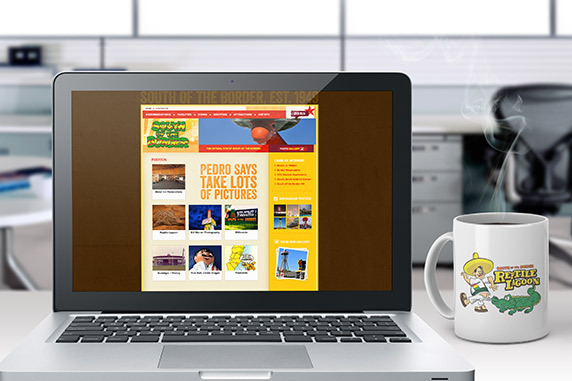 We love hearing suggestions about what you would like to see Pedro add to his website. If you have any ideas, just leave Pedro a comment and we will think about it for future updates. South of the Border is one of the most visited tourist destinations on the East Coast. Our massive complex is filled with all manner of interesting and unique photo opportunities. Whether it’s the statues of animals around the grounds or the live animals in our Reptile Lagoon, visitors have a wide variety of choices. 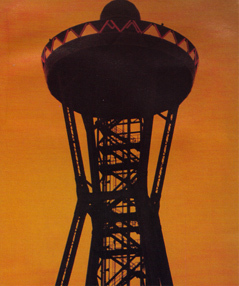 One of the coolest features of South of the Border is our 20-story tall Sombrero Observation Tower. Being 200 feet up in the air gives picture takers an amazing view of the entire grounds and much of the surrounding countryside. Pedro is the official South of the Border mascot. The legend of Pedro dates back many decades and has become a beloved tradition at The Border. There are several statues of Pedro on the grounds of all sizes. However, one the most picturesque statues of Pedro is our glowing neon 100 foot tall Pedro that looms over our grounds. So the next time you see the South of the Border billboards on Interstate 95, be sure to stop by and take a few photos of the family alongside one of our many attractions. Tag your Instagram photos with the hashtag #sobpedro and maybe you will see your pictures on our site in the future. Be sure to follow us on Twitter @sotbpedro, join our Facebook Group and check in on Foursquare. You can also visit our sister sites for our Motocross Training Facility and Blenheim Ginger Ale. South of the Border MX Training Facility is Pedro’s Newest Attraction! South of the Border MX Training Facility is the newest attraction to join the South of the Border family of companies in Hamer, SC. These tracks are located on the north side of South of the Border complex behind Camp Pedro in our spacious wide-open fields. No expense was spared to make this attraction a world-class motocross training facility for everyone from beginner to pro. South of the Border MX offers 3 different specially designed and carefully constructed motocross tracks that rival any facility in the nation and a smaller training track that is perfect for those just learning to ride motocross bikes. The 1.4 mile outdoor MX track features all of the conditions and obstacles a rider will see at the amateur national Motocross tracks. The clay-based soil, with sand and topsoil mixed in, forms the deep ruts and bumps motocross riders need to train on to prepare for the conditions they will face at tracks like Loretta Lynn’s, The Mini Olympics and the AMA Outdoor Nationals. 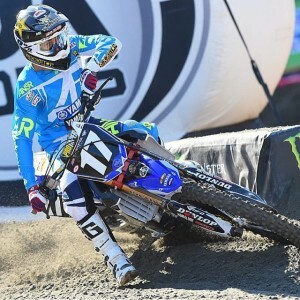 The next track is a full-on Supercross track that replicates the conditions and obstacles found in the stadiums where AMA Supercross races are held. This track is for riders holding an AMA Professional license, and those pros can train on our pro-level Supercross track. The SOBMX Arenacross track was designed to be an exact replica of the tracks in arenas holding AMA Arenacross races. This packed red clay track will have you ready for the stadiums in no time sharing the podium with Chad Cook and all the other big names. 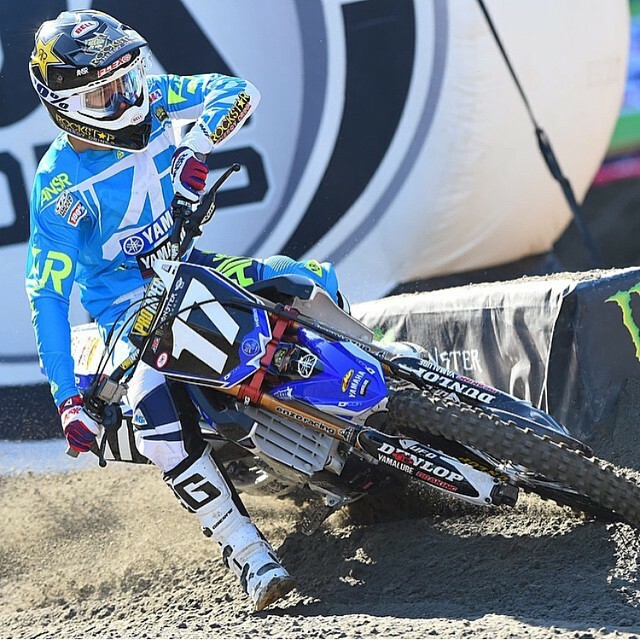 In addition to the outdoor MX, SX and AX tracks the 1.1-mile Skills Development Track features rutted turns, bermed turns, flat turns, a roller section, jumps, and a set of whoops. It is perfect for developing the skills needed to become a motocross champion. South of the Border MX is much more than a collection of places to ride. It’s also a training facility with some of the best instructors around to help you learn how to be a motocross rider, or how to take your skills to the top level in the sport. Our Training Packages are set up with the goal of advancing our riders to the next class and making you a championship rider. 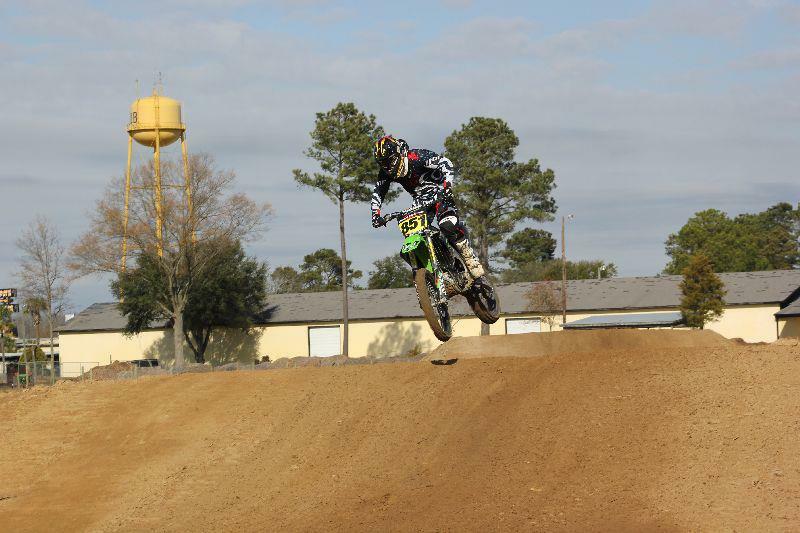 We believe that SOBMX offers a much better package of amenities than any other motocross training facility in America. Things like a gym, pool, restaurants, bike shop, arcades and shops allow for a much more pleasant and convenient training experience. You aren’t stuck in a ratty cabin out in the backwoods; you are right beside one of America’s top tourist destinations and this allows your down time be productive and fun. We hope you will check out our newest feature here at South of the Border when you stop by to check out our facilities, shopping and restaurants. You can find us on Facebook, follow Pedro on Twitter and head over to the website of South of the Border MX and give them a look.